Home > KMS	> Developers’ Notes – Blockbuster Coming Soon! Developers’ Notes – Blockbuster Coming Soon! A teaser image was released on the MapleStory homepage’s Developers’ Notes page. 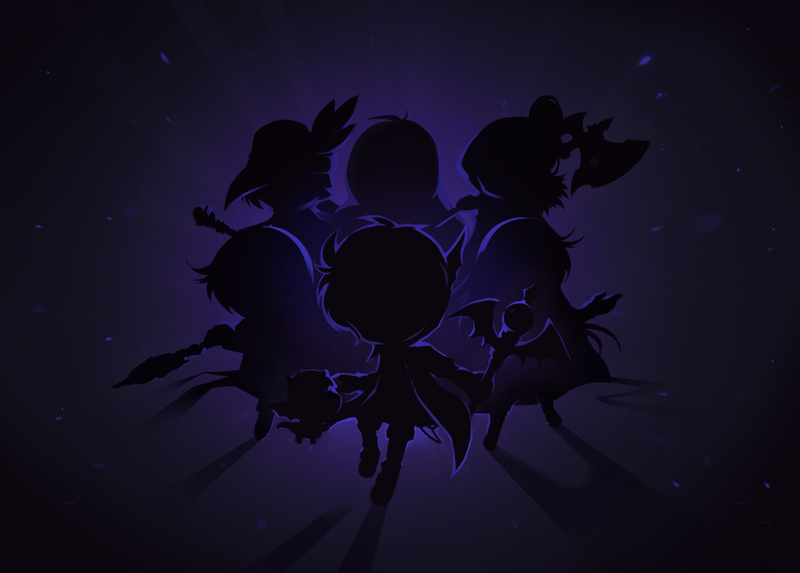 Looks like the next patch will be a new blockbuster, featuring the 6 heroes: Phantom, Mercedes, Aran, Luminous, Evan, and EunWol! Maybe Aran and Evan will finally get their long-long-long-long-long awaited update haha. The end of the last blockbuster, Black Heaven, teased the appearance of Damien as the newest enemy, will he be fighting against the heroes this time? YOU don’t care about them. Many, many others do. Um…care to define “no one”? cuz many others and I who play this game for quests and storyline DO care. That’s unfortunate. I legitimately feel sorry for you guys. As an older player, those who actually follow the cliched and overdone story line seem quite childish to fall for it. Maple Story never actually had an official story, it was YOUR story. You made it happen. You traveled the world on your character. Your friends and how you played, what you found, and your own actions defined your story. None of this premeditated inclusion of “story” existed. It was a needless addition to attract more children. By god, it worked, but when your target audience is obscenely impressionable, it’s not that hard. Sometimes I wish players making these comments would have actually been old or mature enough to play the game back when Nexon didn’t decide how we played, where we trained, and what classes we played by intentionally buffing and nerfing to create market changes. There were few hackers, nx hadn’t paved the permanent pay to win road yet, and the actual players had respect for those who spent a lot of time playing. I don’t expect everyone to understand this, but you have to realize some of us come from a completely different time when maple wasn’t the watered-down hand-holding experience it is today. Yeah yeah, I’m old. I get it. Get off my lawn, and all that lol. I mostly play this game for storyline, I do miss when most classes were equal though. Actually may involve another revamp maybe? for the heroes? I mean, the last blockbuster involved a revamp for the Resistance classes, and they did showcase them in sketch work. That could be a reason for your concern. Btw Bgrmystr2, none of what you said was true about the people playing the game today. Many people here are indeed old maplers like myself(prePirates myself, if you must know), and we look forward to new content, and we still make our own story. Hackers were always the same if you were to base them on player ratio, as less players means less hackers, and vice versa. There was always the kinda of people who only cared about bossing strength (or lvl, in those days, before we had lvl 200s) and made others feel bad if they weren’t as good. Classes had advantages and disadvantages that needed to be balanced out. I still remember when we could spam Blizzard, Meteor, and Genesis. Everyone wanted a mage because there was no flash jump, teleport was the best way to get around, and they were easy to use, Bishops have Holy symbol with no exp balance, F/P had completely spammable Poison mist, and I/L… well, we just froze things, at times, even the game. (Nexon still really needs to fix us… that 1% damage chilling step tho) So take it from the I/L mage, chill. Just chill. But then you have older maplers such as I who cares not for this foolishness. Which adds a very large amount of unnecessary and annoying quests, which unlike most other games do not ask you to kill 999 monsters or collect 200 of this 300 of that and 500 of the same damn thing. We need more people like you, who sees the mistakes of the old maple. Grinding wasn’t rewarding either. PQ’ing was pretty much the only way to go. I think that, as a whole, the current game is much better. Even with the current problems. Really. Yea, wish I can go back and relive through Old Maplestory with the famous people that actually spent time to get what they want instead of money a majority of the way through. As someone who beta-tested the game I think the blockbusters are perfectly fine. They are a neat addition and far better than some “new” class. I personally like the story line and liked it even back when it was barely a thing. Just because you don’t like it doesn’t mean you should speak on behalf of the other older players. Also, the older times definitely felt a bit more if free but it was still annoying as all hell. Taking a month just to hit the 30s unless you play nonstop for days was just dumb. I do miss that it did give a sense of camaraderie with the other players and making friends while training was a blast, especially in Kerning PQ, which actually mattered back then though. It also didn’t help that if you didn’t like a class or it sucked it all felt like wasted effort. While the design now isn’t very free, it at least gives people the ability to choose a class, test out all the fun things it can do, then decide to drop if they don’t like it in the span of a couple days. “Made your own story?” Please. That’s a nostalgic illusion. It never really happened. Maple is a 2D sprite game, it’s not really possible to make much of your own story in that regard. And even assuming it did, which is completely doubtful, the idea that you CAN’T do that exact same thing any more, even given that you have far, FAR more content than before, is ridiculous. Literally, you’re belittling us for our story preferences. Just, wow. Aaaaaand yet again another wild hipster hater with nostalgia filter. Personally their over the top rants have been really amusing to read over the years but tbh it’s getting old and unoriginal. They practically rant about the same stuff over and over again (just different people using different words). Bgrmystr2 dude, I genuinely feel sorry for you for feeling sorry for something worth so little. If you were so mature you would be spending your valuable time on something more significant than writing a wall of text ranting about some fanbase of a freakin game. Hopefully you don’t spend most of your time doing stuff like this on a regular basis ’cause otherwise you betcha that outta look super good on your resume in the future! Welp, so much for being “old and mature” eh? Guess you aren’t so above the childish fanbase you make fun of. You are what you hate after all. You can’t no one like you speak for everyone you moron. Such a dumb typical fallacy only a temper tantrum child would say. Anyway, I hope these revamps of the Heroes are good like the Explorers, Cygnus Knights, and Resistance. Luminous is god tier OP, I hope they dont de-powered the great and awesome Luminous lol. I just hope they make Evan interesting again. Evan’s one of my favorite classes, has been since it came out, but with minuscule changes in it over the years, its growing a bit boring to play. Yeah, Mercedes finally gets implants! YOU IDIOT!!! THEY’RE ALL GETTING IMPLANTS!!!!! The story for the first Blockbuster is fine, but those new equipments were not. Any idea this block buster patch will affect demon slayer? And as for the new blockbuster, what are they planning to do about our other characters who are not heros? Are they just gonna be side characters in this one? What? I was expecting someone to point out how Aran’s gender crisis seems to be over. I guess we wont see 5th Job anytime soon. Max, you do recognize that this poster consists characters that aren’t all heroes right? The one to the bottom right is Suu, to the top middle is Damien, the bottom left is not a character we are very familiar with, but it’s definitely not a playable job, not a BOSS character we have now in the game. kMSt ver. 1.2.021 – System Changes and Bug Fixes kMS ver. 1.2.246 – Job Balancing (Part 2) & Chuseok!